The 2D Studios track allows students to customize their degree to either focus primarily on a specific 2D studio area — Drawing, Painting, Printmaking, Photography — or to work cross-media taking courses in several studio areas. In addition to the basic requirements of the BFA, students in a 2D BFA track will take 15 hours of courses at the 500-level in their area of concentration (e.g. 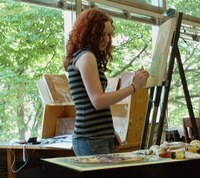 painting, drawing, printmaking, or photography), plus 18 hours of 300-level or above studio art or art history electives. The drawing program consists of intermediate and advanced level courses for students who wish to pursue drawing as an area of specialization or to develop their drawing skills in relation to other studio areas. Students may work in a variety of traditional media, including graphite, charcoal and pastel, and are encouraged to explore the use of new and mixed media as well. Our program allows work in either abstract or realistic idioms. Regular courses are supplemented by a visiting artist program and by special topics courses, such as Landscape Drawing and Anatomy and Life Drawing. A large, well-equipped studio provides individual working spaces for non-figurative drawing and ample community space for complex projects and drawing from live models. The painting program offers instruction at all levels. Based upon the premise that excellent painting may occur within a tradition, or outside of it, our program adheres to no single school of thought, but is structured to allow students to begin to develop their own vision through disciplined training. While beginning painting students are given a solid foundation in the discipline, advanced students, depending upon their respective stages of development, are encouraged to explore avenues of expression pertinent to their own interests. A primary objective of the program is to encourage awareness among students that learning about oneself and the world in which one lives is as important as developing visual skills. Large studios with north light afford painting students on all levels ample working space. Studios remain open for student use at times other than class hours. An open area in advanced painting is reserved for viewing paintings in progress and for critiques. Models are available for those students involved in figurative work. The department's Visiting Artists Program brings notable painters to campus to speak about their own work and to critique students efforts. 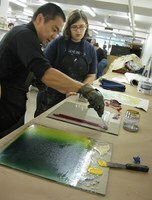 The printmaking program provides breadth and versatility through both its facilities and its faculty. Students are instructed in all traditional printmaking processes: relief (Woodcuts and Linocuts), Intaglio (Etching and Engraving), Serigraphy (Silkscreen), and Lithography; and are also able to work with newer technologies such as photo processes and computer designs. The printmaking program currently has a digital lab (Mac-based), complete with medium format color printer, laser printer, and scanner. Students use this equipment to combine digital imaging with traditional printmaking methods. Digital imaging is an excellent tool for doing preparatory work for traditional print processes. The program emphasizes personal expression and encourages original and serious contemporary concepts in printmaking. Students are encouraged to develop historical perspective in their work, as well as, consider the works of contemporary artists. The Visiting Artists Program brings nationally recognized professionals and scholars in historical, contemporary and technical areas of printmaking to campus each year to lecture about their work, demonstrate special techniques, and work one on one with students. Field trips to important print exhibitions and to museums are also a feature of the program. The photography program explores the unique qualities of the medium and its possibilities for personal expression. Through a series of visual assignments, students experiment with the various reasons for making photographs: as documents, as images designed and directed by the photographer, and as social commentary. Instruction is tailored to the individual students needs and abilities with the hope that each one will find her or his own voice. Students learn fundamental camera, darkroom and electronic imaging skills necessary for convincing picture making. While photographic technique is stressed, emphasis is always given to ideas and how to make those ideas visual and exciting. In addition to the studio courses, photography students are encouraged to take a class in the history of photography. The photographic facilities include a large twenty station darkroom, a ten station digital lab equipped with scanners and large format inkjet printers, a dedicated lab for historic and alternative photographic processes and a studio equipped with professional lighting equipment and view cameras. The photography curriculum is designed to keep a fine balance of both traditional analogue and digital photographic practices.